Here is an incredibly rare opportunity tucked away in a prime Western City Fringe location. A beautiful historic four bedroom homestead, and a separate one bedroom unit set on its own title, together comprising a total of 736m2. Adjacent to the cafes and bustle of Jervois Road, but nestled down a quiet street that leads directly to the expansive Cox's Bay Park. 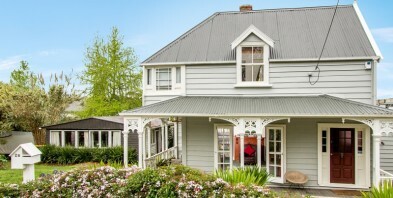 The principal dwelling is a charming and sizeable character homestead that offers genuine family sized proportions and is set out over two levels. The property offers stunning views past the Kelmarna Organic Farm to the Sky Tower beyond. Wonderful sun, multiple living spaces and large bi-fold doors provide easy access to an incredible established garden with fruit trees and garden shed. Number 28 Wharf Road is packed with history, and presents beautifully with eclectic, fun interiors. Very special indeed. On its own title, this one bedroom unit has provided income for many years, but of course brings with it a whole range of possibilities for new owners to explore and maximise. Consult your architect, builder or accountant as to how to utilise this property best. Teenagers, Air BnB, long term rental, art studio... the options are all there to consider. You may even wish to build the family dream home on the entire 736m2 site. Needless to say, properties of this calibre and flexibility do not come up for sale very often. We recommend that you inspect at your earliest opportunity.